February | 2013 | Buddy The Wonder Dog! Get a FREE Doggy Toy! Enter The Cutest Dog picture contest! 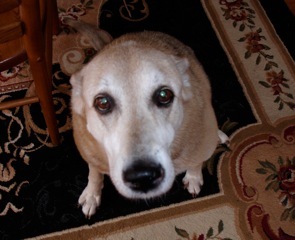 Send your cutest photo to: buddy_the_wonder_dog@yahoo.com BEFORE MARCH 15, 2013!! If your pooch wins, I will send him/her a brand new doggy toy! Which is YOUR Favorite Dog Breed? ENTER NOW for a chance to win a FREE doggy toy for your pooch! Send your favorite photo to: buddy_the_wonder_dog@yahoo.com! Winner will be selected MARCH 15. I’ll contact you via email, and announce your name and the name of your dog on BuddyTheWonderDog.wordpress.com! 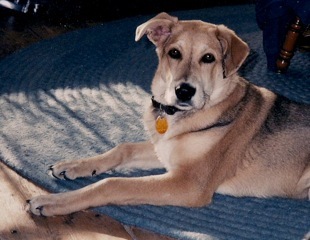 In early May of 1998, Buddy was born in the home of strangers–a German Shepherd/Golden Retriever mix. My little family had moved into an old Colonial that was gun-metal grey but which had once been white. Fuses blew if the coffee pot and the vacuum were both running at the same time. We had no source of heat except for a wood stove in the dining room, and it rained inside the house when it rained outside it. What can I tell you? We were a young couple who didn’t have a lot of money and who didn’t want a big mortgage hanging over our heads; but we wanted a big back yard for the children and the quiet of a country setting in which to raise them. So we made this house into a home. We had each other, we had the kiddies, we even had a cat to scare off the field mice. 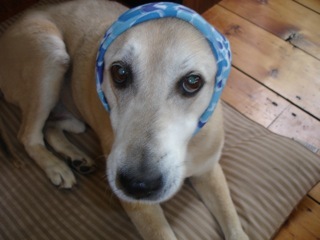 But what we didn’t have was what every home needs: a fun-loving, protective, faithful dog to share his life with us. And then one day, a friend called us and told us that his sister’s dog had been poisoned, leaving behind several puppies only 5 weeks old. That was the day we met the furry fellow who completed our family. Buddy was a wonderful, intuitive soul who become our children’s playmate, our traveling companion, our walking partner, our left-overs finisher, our ears to the night-time world outside our home, enabling us to fall asleep with no worries. Buddy loved green salads. He entertained guests by singing on command. And he was desperately afraid of kittens. Fourteen and a half years after he bounded into our lives, our sweet Buddy slipped away a lot more quietly than he’d come in. He’d lived with us through almost 15 years of good times and sorrowful times, and was faithful to the end. This blog is dedicated to him, Buddy, The Wonder Dog—and to all good dogs everywhere.